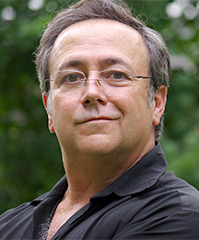 The motorcycle drag racing world, ever in a fluid state, continues to develop daily. Our choices which become actions define our future. Moving forward together we shape our future. This happens whether people intend it to or not, but really, our choices and actions define us, not our words. Case in point, I noticed recently through social media that a prominent member of our Top Fuel motorcycle drag racing community, Mr. Korry Hogan, has a new addition to his family a new baby girl Hayden James Hogan. This precious baby girl was born to mom & dad and her sister London in the month of March, 2019. She’s as adorable as any baby you’ve ever seen, this I promise you. It’s particularly important to me to see this development as I sit upon the grounds of South Georgia Motorsports Park on the evening of Friday 30 March, 2019 and I see in social media this little girl come into the world – while I’m looking out over the 1320’ of race track that almost took her daddy from us. As I sat on the concrete water-box barriers, curled up water hoses beside me during the evening sunset, with everyone gone for the day, I looked out over that race track and I reflected on the whole unfolding play of life, love and the endless pursuit of higher horsepower which is the soul of our sport. I look down upon my cell phone and see Korry, his beautiful wife Blair and daughter London and they are as happy as they can be with God’s gift in their arms. I look out at that race track and I remember Korry roaring past me in the left lane, he was but a few feet from me as I was by the left lane wall photographing him on the launch, following him thundering down the track on another potential 250 MPH pass on his Top Fuel motorcycle. On the day I write of, just after Korry passed me, I saw the liquid spraying a broad pattern on the track as he accelerated past half-track, doing well over 200 MPH. I was horrified, I knew what I saw was liquid being sprayed onto the track and I knew that was trouble, in the worst way. A connecting rod simply failed and windowed the oil pan and motor oil was being spewed onto the track and rear tire while the bike was under full power, up on the rear tire. This could not have happened at a worse time. The bike began to slip and slide in the oil, tagged the left side wall and at over 200 MPH it became a fireball. It tossed Korry off the bike and tumbled down the race track in flames briefly. Mercifully the oil fire went out quickly and the SGMP emergency crew was on it in seconds. It was with great relief that through my 400mm lens, I saw Korry stand up and begin to walk around gingerly. I could breathe now. Unlike Elmer’s last ride, I knew Korry would be okay and that meant everything to me. For I knew Korry would get another shot at life, love and the pursuit of happiness. I also knew that Korry had been off Top Fuel motorcycles, at over 200 MPH more than twice previously. I was terrified the 3 strikes rule would catch up with him. My immediate thought after seeing he was okay was, “Now please tell me you’re smarter than to get back on one.” But that was my thinking, which I kept to myself. 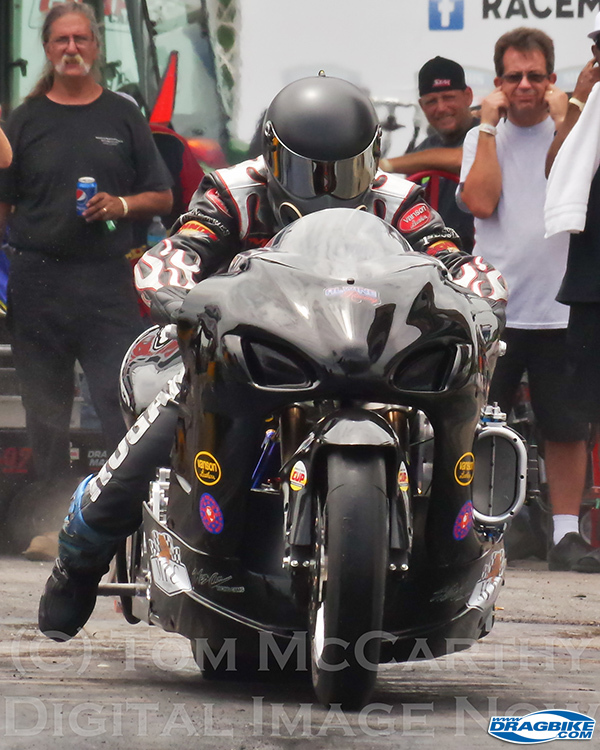 As events unfolded after Korry’s crash, the Alwine family, which owned the bike, for many good and positive reasons decided not to rebuild the bike and withdrew from Top Fuel motorcycle drag racing as an active competing team. It must be noted here that they did so with much consideration and discussion within the team and for the good of many, they ceased active competition operations. Korry, who’s more than capable of piloting any Top Fuel motorcycle; he eventually announced his retirement from Top Fuel motorcycle and wished all his supporters well, then moved on with life. Now he’s a daddy again. No trophy or time slip in the world can equal the joy he now feels in holding his new baby girl. 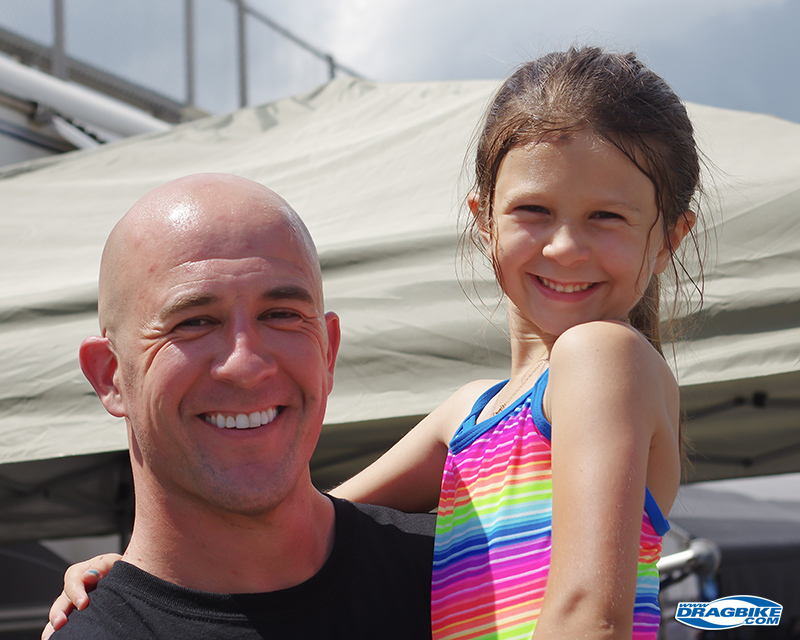 No Top Fuel motorcycle, no matter how many horsepower or shiny new parts could equal the beauty and glow of his beautiful wife Blair, nor compare to the smiles of daughter London. Korry is now winning on a whole new level in life. His decision to retire from Top Fuel motorcycle drag racing led him to where he is now in life and he’s a happier man for it. The world now has a new member that may one day help us all to a better life. Korry can’t help but embrace this moment as he reflects on his past. He was part of one of the most powerful Top Fuel teams ever to compete in the class. The Hogan, Dryden, Alwine team was the first over 250 MPH. Many said it was a fluke, but they fell silent when they did it again and upped it to 255 MPH. No one can take away what they accomplished together. Nor will the motorcycle drag racing community allow the past to be forgotten. Future historians of the sport will remind people of their accomplishments. Don’t be surprised if that bike is fully restored, fired-up and sits proudly in a museum one day. We need this to build a brighter future. By embracing the past, learning from it, then we build a brighter future. 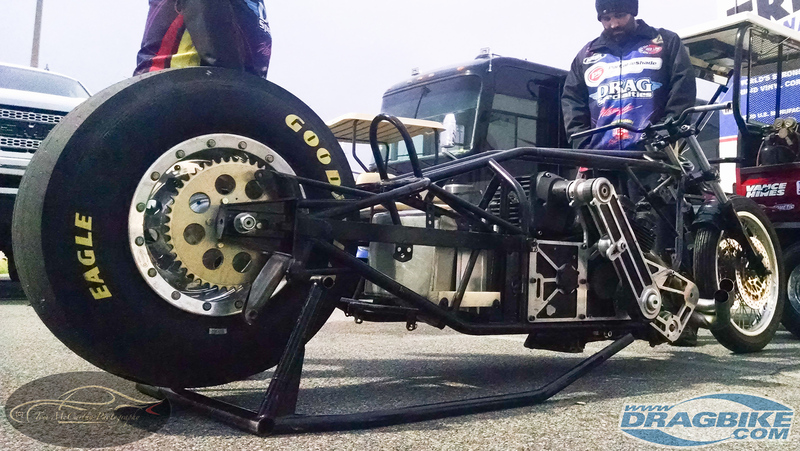 That’s what “Next generation” drag bikes are all about; building quicker, faster and safer machines to further the sport. By embracing the past, studying it, we build brighter tomorrows and recognize in fact pay homage to our roots. In November of 2018, at the Man Cup, Mann Hill Garage World Finals, an old battle scared Top Fuel motorcycle was rolled out of Sam Wills transporter into the waiting hands of Stevie McBride, Roland Stewart and his son Chuck. 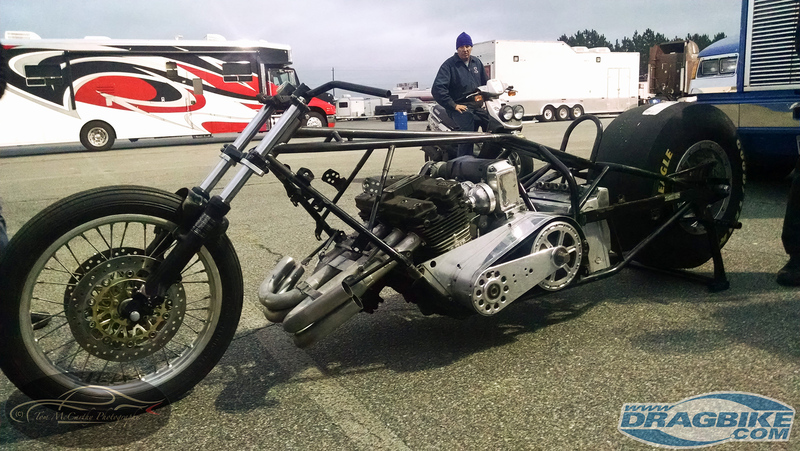 The three Top Fuel motorcycle veterans rolled the bike across the SGMP parking lot and people looked on with curious blank stares. Team McBride is known for having the best of the best in Top Fuel bikes and the sight of them rolling what looked like a “Barn Find” from some TV show was out of character. Onlookers had no idea that was a famous and infamous Top Fuel motorcycle passing before them. That was serious history being walked right by them. 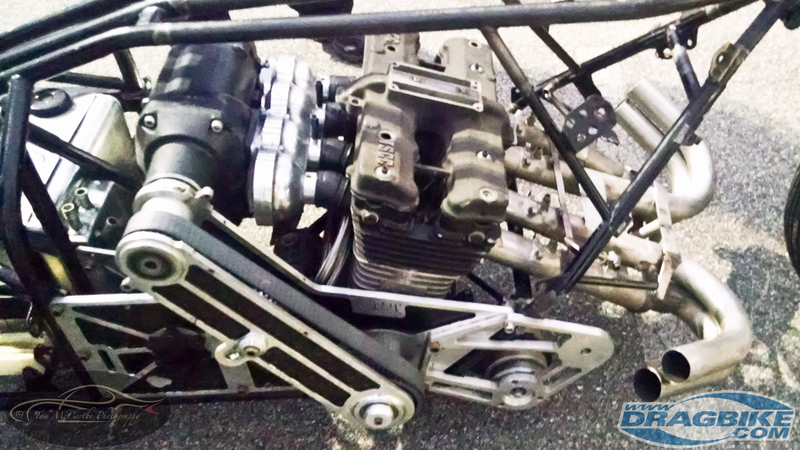 The rolling chassis with the partially intact Suzuki, Top Fuel, cast iron engine short block, was the original Terry Vance & Byron Hines built Top Fuel bike. Terry won several Top Fuel motorcycle championships with that animal and scared the crap out of himself during the process. It was a fearsome motorcycle from its very conception in 1978/79. It was angry and tough to ride from day one. That bike was also Larry the Spiderman’s first Top Fuel bike he owned, when he bought it from Terry and Byron back in 198X. Larry purchased two handfuls of fury when he bought that bike! Power technology preceded chassis technology by a bunch in our sport and that bike was just frightful to watch go down the race track, but Larry & Terry, much to their credit, they beat that thing for all it was worth and pushed it to over 200 MPH, long before it was safe to do so. Today it’s back in the hands of the McBride brothers and they will fully restore it to its former glory. 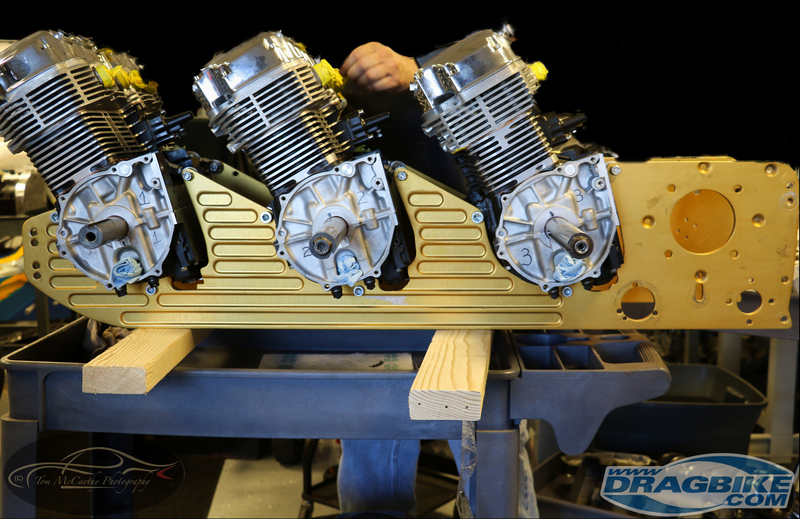 Just as they are in the process of restoring “Blue,” the world’s first 5 second Top Fuel motorcycle. And the restoration of Blue and the old VHR bike are not alone. 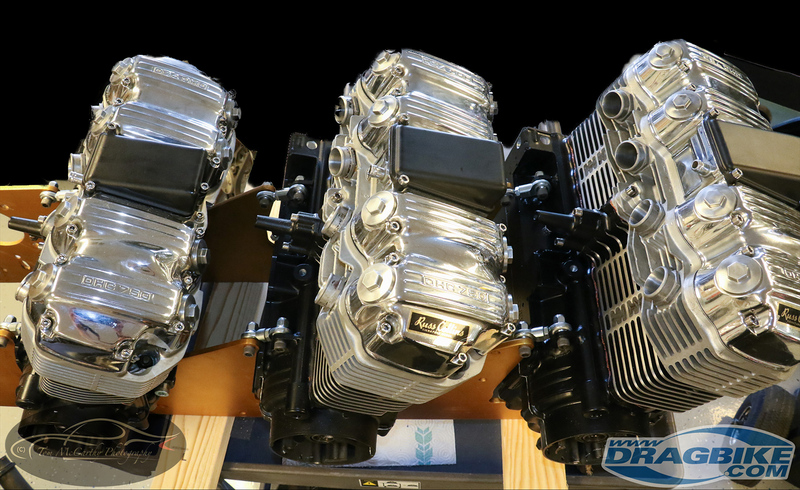 From a garage in California, Russ Collins “Sorcerer” and his old triple engine Honda, the Atchison, Topeka, Santa Fe, Top Fuel triple; they are nearing completion of their full restoration as well. In the months ahead, we may even hear them speak again. We should all embrace this, in fact celebrate this with gusto. Embrace the present, never forget the past and build for a brighter future. It’s okay to walk away from this sport when it’s time to. It is vital to learn from this all and advance our sport. The restoration of these motorcycles, Korry leaving the field of competition: new life springs from this. New racers are trying to break into Top Fuel. Top Fuel Harley sees new blood every year. 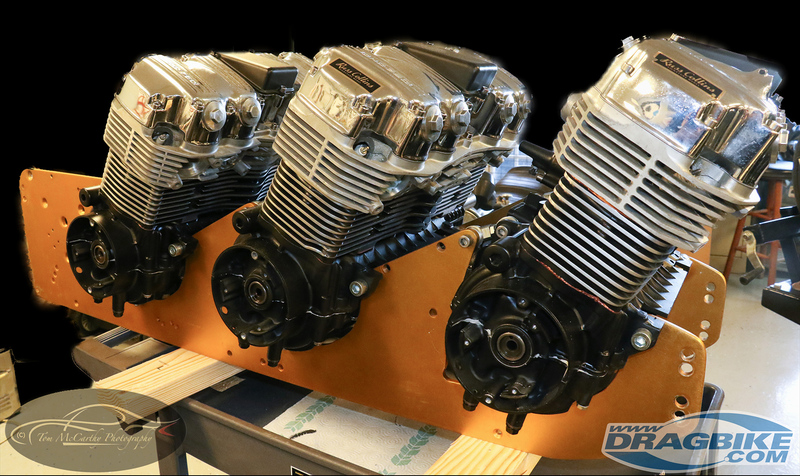 Larry McBride’s shop is busy creating three new Top Fuel motorcycles right now and I’ll be he’s turned away the offer to build more, just so he can get these three new ones done AND get his own bike ready for another title defense. Epilogue: Every moment we have each day is important. You can buy motorcycle parts but no matter how much money you have you can not buy more time or buy someone’s love. Embrace this moment and make the most of it. None of the people I’ve mentioned in this story will be around forever. Your ability to ask them questions, restore old drag bikes and ask them how to build on their experience is limited. Stop thinking about doing things and start doing them. There are 86,400 seconds given you each day. With each tick of the clock, that’s time you can never get back. Use what time you have wisely.